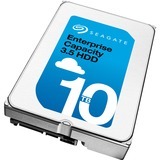 The Seagate® 10TB Enterprise Capacity 3.5 HDD (Helium) is engineered to lower the total cost of ownership in today's large-scale data centers. You can build maximum-density storage solutions that scale to meet your future capacity needs-while slashing your TCO. The Seagate 10TB Enterprise Capacity 3.5 HDD (Helium) lets you turbocharge data transfers with dependably fast read/write performance. Meet your workload requirements while minimizing your data center footprint. Manage increasing volumes of data in cloud data centers much faster thanks to advanced write caching algorithms. With a 5-year limited warranty and the lowest power consumption in its class, the Seagate 10TB Enterprise Capacity 3.5 HDD (Helium) helps you shrink power and cooling costs. Dramatically reduce IOPS/watt while improving rack density thanks to lowest-in-class drive weight. A host of engineering innovations ensures a better hermetically sealed-and so much more dependable-drive. Premium materials, including a wrought-aluminum base, gas-impermeable enclosure, and wide-weld sealed drive design ensure maximum reliability. Humidity sensor and corrosion protection offer increased resistance to harsh environments. For industry-best data security, these drives even offer Secure Download & Diagnostics (SD&D), Seagate Secure Self-Encrypted Drive (SED) and FIPS support.